This is my absolute favorite chocolate cupcake recipe. It yields a cake with moist, tender, not-too-crumbly crumb, the perfect crown (never a sunken middle), impeccable flavor (please don’t skip the espresso powder, it adds a little extra oomph), and the perfect amount of substance (not too heavy, not too light and delicate). While I’ve made this recipe into a full-size cake before, I failed to note in a secure location what I used in terms of pan size, oven temp, and baking time — surely, it’s on a scrap of paper somewhere… For now, please reference the Wilton Cake Baking Time and Batter Amounts chart if you’d like to make a size other than adorable cupcakes (the recipe yields about 6 cups of batter). Preheat the oven to 350°F. Grease two 12-cup muffin pans (preferably not nonstick) with butter; set aside. In a large bowl, whisk together brown sugar, white sugar and salt. Using a fine mesh sieve, sift millet flour through cocoa powder into the bowl containing the sugar mixture. Whisk together dry ingredients. In a separate, small mixing bowl, whisk together wet ingredients (canola oil through vanilla extract). Pour buttermilk mixture into dry ingredients; whisk just until combined and lump-free. Fill muffin cups with a level 1/4 cup⁴ of batter. Immediately transfer to preheated oven and bake for 20 minutes, or until a toothpick inserted in the center of a cupcake comes out clean. Allow to cool in pan for about 5 minutes. 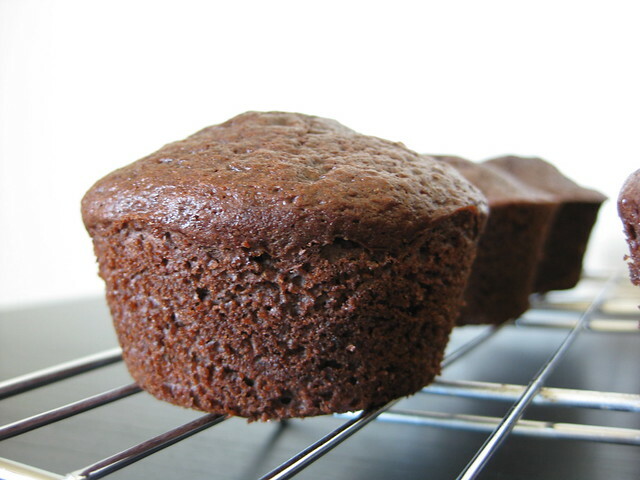 Remove cupcakes from the tins (you may need to loosen cupcakes using a spatula or thin knife) and cool completely on a cooling rack. ¹ I like Medaglia D’ Oro Instant Espresso Coffee. Available at Whole Foods, occasionally Target, and Amazon (as of this moment, only in a six pack, which is just a tad excessive for this purpose…). ² I use Droste cocoa powder. It can be a bit difficult to track down, but totally worth it. Find it on Amazon.com (three pack or single box) or at upscale grocers (Drager’s Markets in the Bay Area and occasionally Whole Foods). The most important thing is that you use a Dutch-process (alkalized) cocoa powder for this recipe, not a natural cocoa powder such as this one by Hershey’s. Place eggs in a bowl or cup with about an inch of space remaining at the top. Fill cup with hot tap water, covering eggs completely. Allow eggs to sit in hot water for 5-10 minutes (while you prepare/measure out the remaining ingredients, perhaps?). Remove eggs from water, dry completely with a clean towel, and proceed with recipe. ⁴ I find it easiest to use a #16 cookie/ice cream/portion scoop (equal to 1/4 cup or 4 tablespoons). Available at Sur La Table, Crate and Barrel, Amazon, and occasionally Marshalls/T.J. Maxx/HomeGoods.